Both the 'Hammond' and 'Carlotta' lumber companies have performed a great many duties in their time. 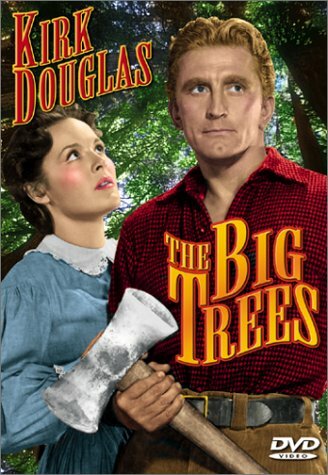 Such as, cut wood, chop down trees, plug dams, and finance this 89 minute movie made in 1952; Directed by Felix E. Feist; and Starring: Kirk Douglas, Eve Miller, Patrice Wymore, with Edgar Buchanan. Tiimberrrrrrrr! As soon as I sorted out some trivial troubles I've been having back home in Wisconsin, I says to myself, 'Jim Fallon (Kirk Douglas)', for that is my name, 'You'll have no problems whatsoever earning some cash over in California. You've got the manpower. You've got the savvy. Plus you've got the law by your side too. All you need to do now is go over there with your men and cut down those humongous trees!'. But no. I'm afraid to say things don't really pan out in the way I hoped they would, folks. As you name it -- man, woman, or cat -- everyone living in this berg tries to bar my path, one way or another. For instance, Sister Alicia Chadwick (Eve Miller) and her bible-bashing buddies don't want me to chop down their red-woods on religious grounds. The town Judge then tries to halt my profitable venture by tying it up in red-tape. Heck, even my best bud, Yukon Burns (Edgar Buchanan), smacks me in the mouth when things start spiraling completely out of control. Don't you worry though, folks! I'm a business man by trade. A very sneaky and devilish business man who has a plan up his sleeve come storm or high weather. Yet again, that's most probably why what next transpires all kicks off when a lot of bark becomes much worse than my bite. As my gal Daisy (Patrice Wymore) flashes her leg - "Frenchy" (John Archer) never even attempts to beg - two men die one after the other - and at the end of the day, you've always got to lend a helping hand to your righteous yet religious brother. Wait a minute? Or should that be sister? Hmmm. Damn. Not Dam. Now please let me start off my review by saying that despite its pedestrian title, 'The Big Trees' is one hell of a great film to watch. Yeah. You name it. It has it. It's full of bold and archetypal characters. It has a pretty nifty plot-line to follow. The actors are great, through and through. And overall -- hands down -- this is a film I'm sure pleased I sat down and gawped at. Having said all that, though, there was something about this movie I do feel is well worth mentioning. And that's all to do with the conceptual pacing and content of the total narrative. You see, from my point of view, there were so many things that happened in this flick, sometimes, it did get a bit too hectic where the story is concerned. For instance, within the first twenty minutes, you'll perceive Kirk's character as some sort of fast-talking business-man, who always seems to know what to say or do. Then, in the next twenty minutes, he transforms into the bad guy, swindling the townsfolk out of their property. After that, he drops out of view completely, and you then focus on the films secondary players. Before finally, this whole 'life-cycle' repeats itself all again in a much quicker fashion, resulting in loss, redemption, plus all of that sort of thing. Now please don't take my observations the wrong way, folks. Of course I mean this with all due respect. Because it doesn't really hinder this movie at all. Instead, what is does do, is make certain 'sub-plots' feel disposable in retrospect. Coming across like jovial or poignant interludes meandering in a much more grander picture. Also, something else I'd like to mention about 'The Big Trees', is how it tries to handle the subject of 'nature verses profit', plus how it's main lead -- Kirk's character -- grows as a person when he eventually comes to realize that money isn't everything. Well, as you can clearly see from what I have stated up above, Kirk does mentally change throughout the course of this film. Nothing definite mind you. Just a behavioral change when he comes to the big understanding that no matter who you think you are, or what you think you have accomplished in your life, at the end of the day human beings are nothing more than a cog in a much bigger and longer wheel. Personally speaking, I really do love this particular aspect about this flick. As I have a sneaking suspicion that's what's at the heart of this story -- the evolution of society interacting with human existence -- by stating in a rather simple and jovial manner, that even though money makes the world go round, mother nature will be around for a lot-lot longer. Anyway. That's enough of me and my pontificating point of view. I think it's about time for some filmic-facts. Don't you? (1) 'Warner Brothers' first released this production in New York City, on the very same day that the Yorkshire cricketer, Reginald Allen, passed away -- the 5th of February, 1952. (2) Loosely translated, this project was entitled 'The Valley of The Giants' in Austria; 'The Law of Force' in Spain; and 'Great Men of Forests' in Finland. (3) Most of this movie was shot on location within the American state of California. This includes Eureka, Redwood Groves, and Orick. (4) In the scene where Kirk's character, Jim Fallon, reads at the dinning table, he's actually quoting from Psalms 41, verse 1. (5) The main reasons Kirk Douglas agreed to star in this film for free, was because this was the only way 'Warner Brothers' would release him from his contract. Yep. That's correct. This was Kirk's last flick for the big W. (6) I kid you not; numerous members of the 'Quaker Congregation' and the 'Choir' were populated by students who were studying at 'Humboldt State University'. (7) This was the last story Kenneth Earl ever penned after spending sixteen whole years in the business. Some of the other films he contributed to, include, Cary Grant's 'Mister Lucky'; Red Skelton's 'Bathing Beauties'; and Betty Grable's 'Footlight Serenade'. (8) After this film leaped out of its stable, Kirk Douglas starred in the Western, 'The Big Sky', Eve Miller starred in the bio-pic, 'The Winning Team', and Patrice Wymore starred in the musical-comedy, 'She's Working Her Way through College'. Overall I'd say that 'The Big Trees' was very much like an apple tree. It has a firm center. It has a sweat taste. And with some extra added forethought, it will always be around, a lot long after we've all drifted off into the breeze.